RCIA stands for the Rite of Christian Initiation of Adults, the process by which an adult person is initiated into the Catholic Church, through Baptism, Confirmation, and First Holy Communion. Through this process the adult is formed in the Christian faith, with the local parish community serving as both catechists and models. Before beginning RCIA, those interested in learning more about the Catholic faith should attend RCIA Inquiry meetings on Thursday nights at 6:30 PM in the St. Clare Room from early August through the end of October. 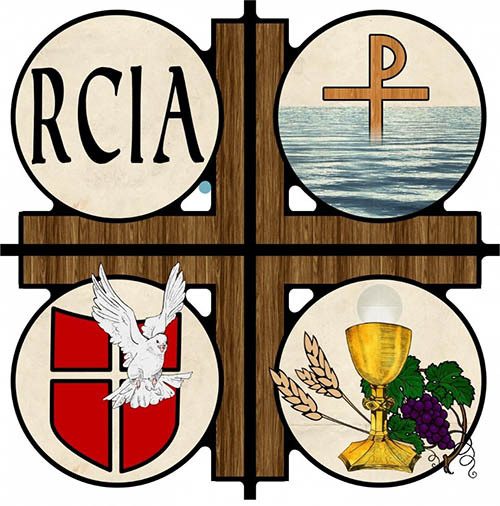 RCIA has been around since the early Church - and was the method in which the Church prepared un-baptized adults to be received into the Christian Church (which later became known as the Catholic Church). The RCIA process was an intense period of study, prayer, and conversion which (in the Church's early days) often lasted up to three years. During the process, a sponsor would testify to the entire assembly of the conversion, authenticity, and genuine readiness of the individual. After some time, the process was put aside and in its place private preparation was used. This phase mimics the first experience of hearing the Word of God, of becoming aware of God's presence, love, and work in our lives. In this first awareness, one is getting to know who God is through story-telling of their own life and the stories of the Bible. It is the phase in which the first stirrings of faith in Jesus Christ begin. For one that is already baptized, it is a re-awakening of that awareness and beginning of renewal, as well as first intentional integration into the community of believers. The duration of time in this phase for the un-baptized and baptized, but un-catechized may be anywhere from 6 weeks to six months, depending on how one progresses. St. Alphonsus offers RCIA Inquiry on Thursdays at 6:30 PM in the St. Clare Room in August through October. This phase is the apprenticeship towards Christian discipleship. It is accomplished through formal instruction in the core teachings and beliefs (doctrine) of the faith and experienced through liturgy, service, and parish community life. This comprehensive approach aims for a thorough integration of the faith. The Catechumenate follows the liturgical cycle of the Church since that is how the faith is experienced in daily life. For the un-baptized, and the un-catechized this may last possibly longer, depending on when a person begins and how they progress. For one who is baptized and well-catechized, this period is fit to one's individual needs, but still retains the necessary formation from both formal instruction and integration with the parish. This phase, indicated by its name, points to an intense, inward reflection and discernment. In this phase, the candidate seeks to be purified in their intentions to follow Christ more fully, to recognize any sinful attachments or attitudes that still separate or diminish their relationship with Christ, and to receive the light they need to follow him more authentically. It is no longer a time to "learn teachings that were not picked up" - those must be completed fully prior to beginning this phase. Included in this phase are spiritual retreats, and smaller rituals intended to support and assist each person. This phase occurs for the un-baptized and un-catechized (baptized) during Lent. Ritual: Sacraments of Initiation - Baptism, Confirmation, First Holy Communion for the un-baptized. For the baptized, Profession of Faith for non-Catholics, plus Confirmation and First Holy Communion. For those Catholics who have only been baptized, Confirmation and First Holy Communion. It is said that all of the baptized faithful are continuing this phase because we are still reflecting on the story of Christ, and still experiencing the conversion from our Christian initiation, regardless of when that occurred. The Mystagogia, strictly speaking, occurs for the neophytes and newly professed members during the period between Easter and Pentecost. Some experts propose a year-long Mystagogia. The Mystagogia period is similar to the story of the walk along the road to Emmaus. The disciples were so excited and filled with wonder telling the story of Jesus' life, death, and resurrection that they did not recognize it was Christ to whom they were speaking, until the breaking of the bread. He helped them understand his story in relation to the Scriptures, and all they had experienced. It is a time of reflection, celebration, and active participation in the life and mission of the Church. Is RCIA a lecture series for anyone to attend? RCIA is a discernment and preparation process, not an adult education lecture series or catechism for Catholics seeking to refresh their own knowledge of the faith. Because of the trust needed for participants to share openly, this process is only for those discerning to enter the Church. To respect the inherent vulnerability and sensitive nature of the process, we refrain from inviting general visitors/parishioners to attend. The only non-participants that are permitted are team members, clergy, and sponsors. Those who are interested in learning more about becoming Catholic should contact the Formation Office at 225-261-4644.